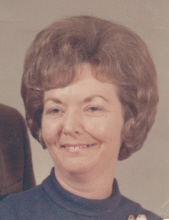 Rachel Juanita Toney Johnson, 85, of Lawndale, passed away Friday January 25, 2019 at home. Born December 24, 1933 in Cleveland County, she was a daughter of the late Burell Toney and Minnie McFarland Toney. She was retired from PPG and was a member of Double Shoals United Methodist Church. In addition to her parents, she was preceded in death by her husband Blaine Johnson. Survivors include three sisters, Mabel Owens of Shelby, Norma Hoyle of Lawndale and Janice Kaye Eudy of Matthews. The memorial service will be 2:00PM Tuesday at Double Shoals United Methodist Church with Rev. Randi Godfrey officiating. Memorials may be made to Double Shoals United Methodist Church, 2038 Rehobeth Church Rd., Shelby, NC 28150. To send flowers or a remembrance gift to the family of Rachel Toney Johnson, please visit our Tribute Store. "Email Address" would like to share the life celebration of Rachel Toney Johnson. Click on the "link" to go to share a favorite memory or leave a condolence message for the family.